Now you can Easily Switch between Headphones & Speakers! The MK-5 offers microphone feed-through operation for use as a PC Headset Speaker Switch as well. Both headphone and microphone connections from your Headset connect easily to the the MK-5. The MK-5 Computer Audio Switch Box is a great solution for conveniently switching your computer's audio between headphones and speakers. There's no more hassle going through that rats nest of cables on the back of your computer! Plus, it saves wear and tear on your audio jacks. With the MK-5, switching between speakers and headphones is now very EASY, FAST, and EFFORTLESS! Plus, as an added feature, the MK-5 provides an easy access "front panel style" solution for connecting a microphone to your computer. Installation is simple. The MK-5 makes headphone, speaker, and microphone connection & selection simple, fast, and very convenient. If you listen to CD's, Online Radio, DVD's, MP3, or ANY audio source on your computer, or if you're involved with Video Conferencing, Voice Chat, or Internet Telephone communications, the MK- 5 is the perfect accessory! Three input jacks for easy connection to your computer's audio output, speakers, and your headphones. Reliable & convenient operation. The MK-5 is very EASY to install. IN STOCK - QUICK SHIPPING! The MK-5 is the FAST and CONVENIENT way to switch between Headphones and Speakers for your computer's audio! For Internet telephony, the MK-5 also has a microphone feedthrough - perfect for Internet Telephony and Video Conferencing. The MK-5 connects easily to headphone / microphone headsets. 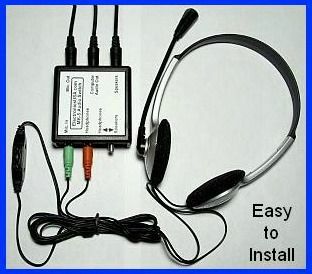 It offers "front panel style" connection convenience for your computer headset. If your headset uses small 3.5mm (1/8 inch) stereo plugs EACH for both headphones and microphone, then the MK-5 will work great for you! You will need TWO if you plan to use a headset with a microphone. You will need just ONE if you only want to switch between headphones & speakers. See the above hook-up diagram. We offer shielded stereo cables in two and six foot lengths. These cables have a 1/8 inch (3.5 mm) stereo mini plug on each end. MK-1 Generic Audio Switch : Switch two different audio sources to one output. MK-4 Computer Microphone Switch : Switch TWO microphones with ONE computer. MK-7 Computer Audio Speaker Switch : Easily switch the audio outputs of two computers to one speaker set. MK-10 Computer Speaker Switch : Switch TWO sets of speakers with ONE computer. SVS-14 AV Switch : A 4 input / 1 output Audio & Video selector switch for use with DVD players, VCR, Computer Game Systems, Stereo CD & MP3 players, and more. With proper cables, it can be used for computer audio too.